Winner of the 2014 Helen McCloy/Mystery Writers of America Scholarship for Mystery Writing. Travel with Killer Legal Reality Radio and Lida Sideris, an attorney of great faith, remarkable perseverance, and of unquestionable ability who has had an extraordinary life journey leading up to the publication of her first crime novel and the development of her main character Corrie Locke, an attorney much like her creator, in one of the finest fiction mystery crime novels written – Murder and Other Unnatural Disasters. Lida tells us of her continued efforts culminating in obtaining her dream job with Lorimar-Telepictures, her magazine and news article writings, her teleplay, her acting, her wonderful novel Murder and Other Unnatural Disasters, and her future hopes and dreams and upcoming novels centered around private investigator Corrie Locke. An admirable person who has repeatedly committed herself to Grabbing Hold and Seizing the Day, and, of course, great success has followed ! Lida Sideris…Another Killer Legal Reality Radio exclusive. 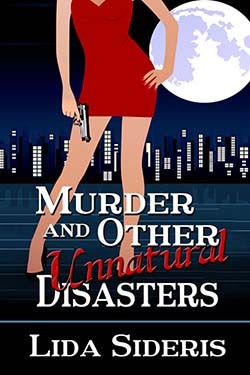 Just click on any of the highlighted links to go to Amazon.com to purchase her first mystery novel in this wonderful series starting with Murder and Other Unnatural Disasters, and private investigator Corrie Locke, or access Lida’s website to read more about her and Murder and Other Unnatural Disasters. Amazon – Murder and Other Unnatural Disasters. You can also purchase this great mystery novel on Barnes and Noble, as an IBook on your smartphone or computer, or KoBo ! Read an excerpt from Lida’s novel Murder and Other Unnatural Disasters here.